Definition at line 13 of file cardwindow.h. Definition at line 63 of file cardwindow.cpp. Definition at line 131 of file cardwindow.cpp. Definition at line 542 of file cardwindow.cpp. Definition at line 229 of file cardwindow.cpp. Referenced by CardButton::OnLButtonUp(), and WndProc(). Definition at line 531 of file cardwindow.cpp. Definition at line 249 of file cardwindow.cpp. Definition at line 270 of file cardwindow.cpp. Definition at line 109 of file cardwindow.cpp. Definition at line 334 of file cardbutton.cpp. Definition at line 702 of file cardwindow.cpp. Referenced by CardWindow(), and SetBackColor(). Definition at line 104 of file cardregion.cpp. Definition at line 152 of file cardwindow.cpp. Definition at line 559 of file cardwindow.cpp. Definition at line 44 of file dropzone.cpp. Definition at line 583 of file cardwindow.cpp. Definition at line 123 of file cardwindow.cpp. Definition at line 618 of file cardwindow.cpp. Definition at line 607 of file cardwindow.cpp. 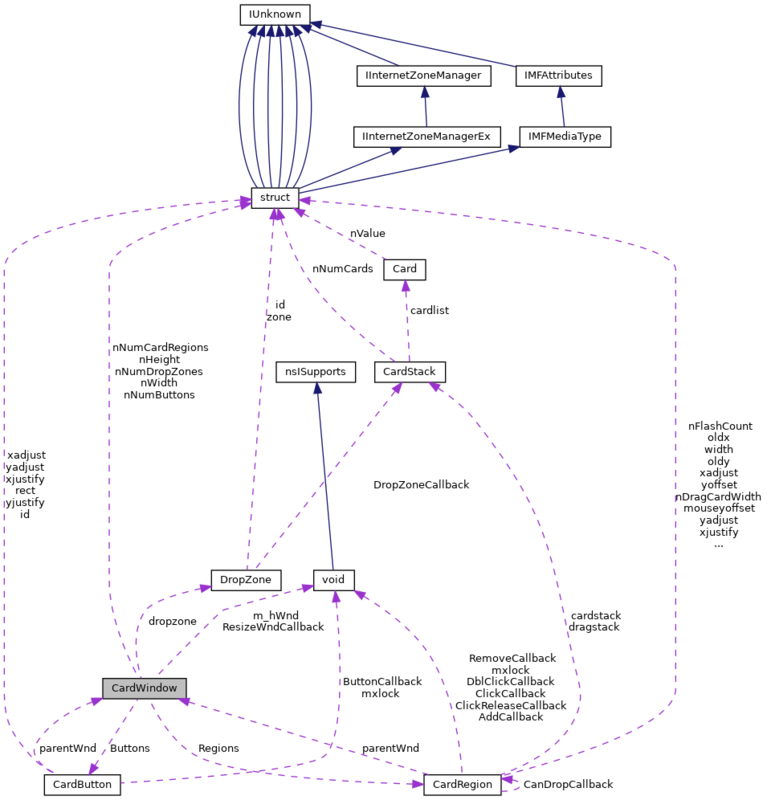 Referenced by GameFinished(), NewGame(), and SuitStackAddProc(). Definition at line 738 of file cardwindow.cpp. Definition at line 224 of file cardwindow.cpp. Definition at line 34 of file cardrgnmouse.cpp. 40 //cards. Only include those which allow drops. Definition at line 22 of file dropzone.cpp. 30 //let that take priority over any other card stack. Definition at line 56 of file cardwindow.h. Definition at line 66 of file cardwindow.h. Definition at line 55 of file cardwindow.h. Definition at line 31 of file cardwindow.h. Definition at line 276 of file cardwindow.cpp. Definition at line 743 of file cardwindow.cpp. Referenced by Paint(), CardRegion::PrepareDragBitmaps(), CardRegion::PrepareDragBitmapsThreed(), and CardRegion::Render(). Definition at line 553 of file cardwindow.cpp. Referenced by DeckClickProc(), CardRegion::DoFlash(), EmptyStacks(), CardRegion::Flash(), NewGame(), CardRegion::RedrawIfNotDim(), and ShowDeckOptionsDlg(). Definition at line 10 of file dropzone.cpp. Definition at line 728 of file cardwindow.cpp. Referenced by LoadSettings(), and ShowDeckOptionsDlg(). Definition at line 176 of file cardwindow.cpp. Definition at line 805 of file cardwindow.cpp. Definition at line 696 of file cardwindow.cpp. Definition at line 687 of file cardwindow.cpp. Definition at line 339 of file cardwindow.cpp. Definition at line 16 of file cardwindow.h. Definition at line 15 of file cardwindow.h. Definition at line 100 of file cardwindow.h. Referenced by CardButtonFromId(), CardButtonFromPoint(), CreateButton(), DeleteAll(), DeleteButton(), Paint(), SetBackColor(), and WndProc(). Definition at line 109 of file cardwindow.h. Referenced by CardWindow(), CreateButton(), CreateCardPalette(), CreateRegion(), GetBackColor(), PaintCardRgn(), and SetBackColor(). Definition at line 106 of file cardwindow.h. Referenced by DeleteAll(), DeleteDropZone(), GetDropZoneFromRect(), and RegisterDropZone(). Definition at line 96 of file cardwindow.h. Referenced by CardWindow(), PaintCardRgn(), and SetBackImage(). Definition at line 97 of file cardwindow.h. Definition at line 91 of file cardwindow.h. Referenced by Create(), Destroy(), operator HWND(), Paint(), Redraw(), SetBackColor(), and ~CardWindow(). Definition at line 94 of file cardwindow.h. Referenced by CardWindow(), CreateRegion(), GetBackCardIdx(), and SetBackCardIdx(). Definition at line 92 of file cardwindow.h. Referenced by GetHeight(), Update(), and WndProc(). Definition at line 101 of file cardwindow.h. Referenced by CardButtonFromId(), CardButtonFromPoint(), CardWindow(), CreateButton(), DeleteAll(), DeleteButton(), Paint(), SetBackColor(), and WndProc(). Definition at line 104 of file cardwindow.h. Referenced by CardRegionFromId(), CardRegionFromPoint(), CardWindow(), CreateRegion(), DeleteAll(), DeleteRegion(), DistributeStacks(), EmptyStacks(), GetBestStack(), Paint(), SetBackCardIdx(), SetBackColor(), Update(), and WndProc(). Definition at line 107 of file cardwindow.h. Referenced by CardWindow(), DeleteAll(), DeleteDropZone(), GetDropZoneFromRect(), GetNumDropZones(), and RegisterDropZone(). Referenced by GetWidth(), Update(), and WndProc(). Definition at line 103 of file cardwindow.h. Referenced by CardRegionFromId(), CardRegionFromPoint(), CreateRegion(), DeleteAll(), DeleteRegion(), DistributeStacks(), EmptyStacks(), GetBestStack(), Paint(), SetBackCardIdx(), SetBackColor(), Update(), and WndProc(). Definition at line 111 of file cardwindow.h. Referenced by CardWindow(), SetResizeProc(), and WndProc().